Pasta comes in many shapes and colours. Choose it according to the sauce with which it is being served rather than to add interest. A long thin or flat pasta, such as spaghetti or tagliatelle, is best served with a smooth or finely minced sauce with plenty of liquid which will coat the outside of the pasta. Penne or fusilli and other large pasta shapes are better with a thicker, chunky sauce that can be held in the twists and folds. Pasta is generally made with hard durum wheat, which is salted and mixed with water then kneaded and shaped. It is available in four main colours: yellow (plain); brown (made with wholemeal flour); green (with added spinach); and red (flavoured with tomatoes). To prevent pasta sticking together when cooking, add it quickly to fast-boiling water and stir once. You could add 1 tbsp olive oil to the boiling water, but only if the pasta is to be served cold, as a salad, or not served immediately. This is because pasta cools very quickly and as it cools, the starches make it become gluey and sticky. Serves: Per person, serve 100-125g for a main course and 50-75g for a side dish. For every 100g of pasta you wish to cook, you will need to use 1 litre of water. For 500g pasta add 5 litres of water to a large pan. The pan should be large enough to allow the pasta and water to move freely during cooking and prevent the pasta from sticking. Bring the water to a fast rolling boil so that it is bubbling rapidly. Add salt to taste, if required. Pour the pasta into the boiling water and boil for 10-12 minutes until al dente (tender but with a little resistance when bitten). Stir once with a wooden spoon. Test after 10 minutes, then every minute afterwards until the pasta is just cooked to prevent overcooking. Drain the pasta thoroughly in a colander over the sink and serve immediately. To cook long pasta, such as spaghetti, tagliatelle or capellini, hold the pasta at one end and feed the other end into the boiling water. Coil the strands in the pan as they soften in the hot water. Make a quick, fresh tomato sauce to serve 4. Mix 450g finely chopped vine tomatoes, 1 deseeded and finely chopped red chilli (optional), 1 crushed clove garlic and 3 tbsp extra virgin olive oil in a bowl and season. Stir in a pack of torn fresh basil leaves then add to 400g freshly cooked pasta. Stir until the pasta is evenly coated. Serve immediately. 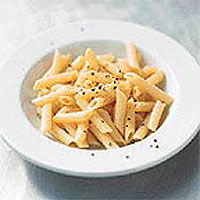 Alternatively, dress the pasta with extra virgin olive oil, Parmesan shavings and ground black pepper. A large saucepan, measuring jug, colander and a wooden spoon.